Al Henderson at his studio in St. Albert. From the time he was a child who stole cookie dough from his mother while she was baking to use it to play and create small sculptures, Al Henderson always knew he would be an artist. “I’m just one of those people who always knew what he wanted to do,” the local artist said. 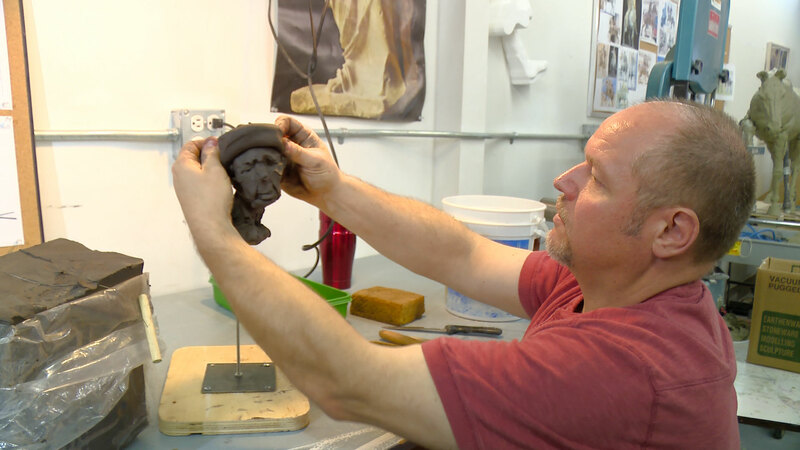 Now living in St. Albert, Alberta, Henderson spends his time teaching sculpting at the University of Alberta when he is not working out of his studio near Big Lake. 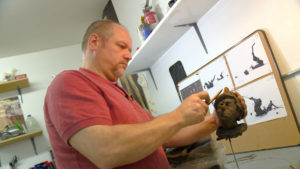 Although not many have had the pleasure of seeing inside Henderson’s private studio, for those that have visited the humble workshop — which is unassumingly tucked-away in an industrial park on the outskirts of the city — they are met by hundreds of sculptures and sketches, reminiscent of a mystical world one might find on a Hollywood set. The enchanting sculptures of majestic horses, fearless warriors and other free forms are accompanied by a vast selection of worn craftsmen tools and an earthy smell of damp clay. Displaying his talents for the RogersPlace.com crew [watch above], Henderson began working with a round ball of clay, slowly forming a head using primarily his hands as tools. While explaining skeletal framework and muscle construction, the artist was able to form a lifelike figure within minutes of adding, removing and smoothing out clay. Without using pictures or any other points of reference, Henderson displayed the ‘free style’ that was used for Figures in Motion. 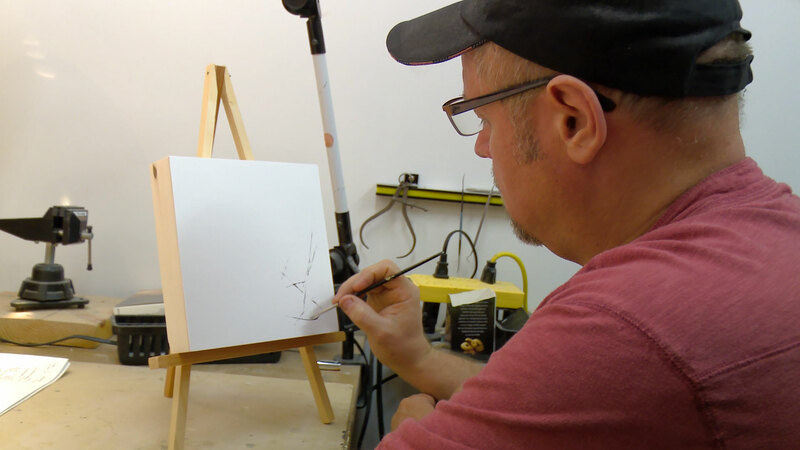 Al Henderson demonstrates how the black marks that accompany Figures in Motion will look. The black marks are representative of the marks left behind on the ice by skaters. Al Henderson demonstrates his sculpting. 3D-printed rendering of one of the Figures in Motion. Selected by the Edmonton Arts Council as the signature artist for the Downtown Community Arena, Henderson proposed a mosaic to represent the spirit and energy captured by a community space — aptly named, Figures in Motion. “The idea was just sculpting the spirit of the [Downtown Community Arena] — it’s wild, it’s proud,” said Henderson. “Just think of going to a community rink; it’s a lot of noise and a lot of things going on in a kind of tumultuous chaos,” he added with a smile. The mosaic, which will be featured on the wall as you enter the Downtown Community Arena, will be both two-dimensional, with paint representing the marks left on the ice by skaters, as well as three-dimensional figures affixed to the wall. “Not only does this [artwork] enhance Rogers Place, I think it places Rogers Place in the community and in the City of Edmonton,” said Katherine Kerr, Public Art Director of the Edmonton Arts Council. Figures in Motion is one of four public art commissions for Rogers Place as part of the City of Edmonton’s Percent for Art policy, dedicating one per cent of qualifying construction costs to acquiring public art in City infrastructure. “Every single one of the artworks can be accessed without buying a ticket to go into the arena,” said Kerr. 3D-printed rendering of one of the Figures in Motion. The idea for Figures in Motion dates back to when Henderson was first out of art school and experimenting with bronze and casting. 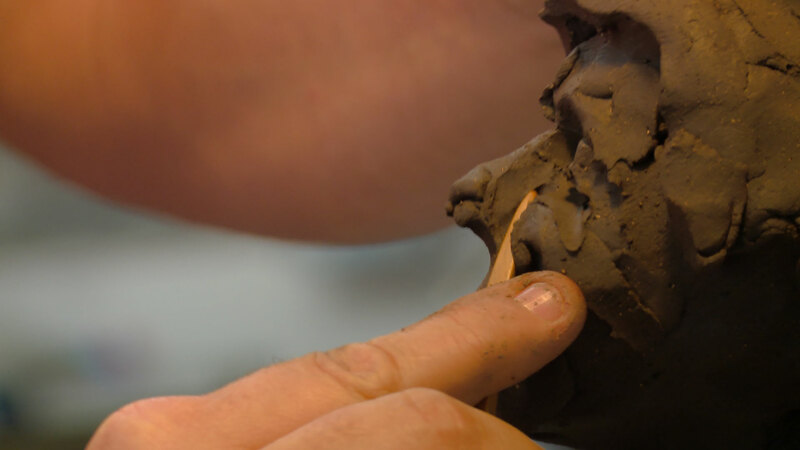 “It was just a really relaxing, free process of just grabbing clay or wax. You just make it into these figures with no particular plan. There’s no narrative to it,” said Henderson. Not based on any particular people or characters, the figures Henderson makes are created without any set of guidelines or rules. 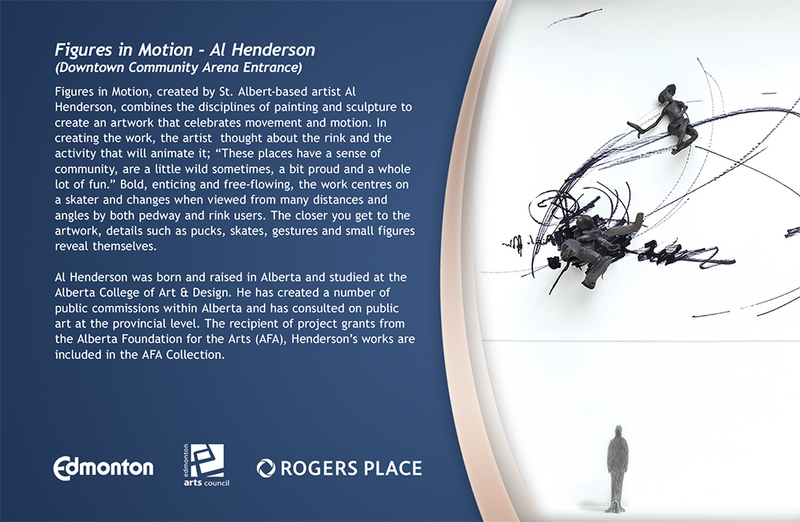 Although the figures Henderson creates are not representative of anyone in particular, he has studied what it means to capture the motion inside a community arena by observing the MacEwan University Griffins hockey team, as well as watching figure skaters on the ice. 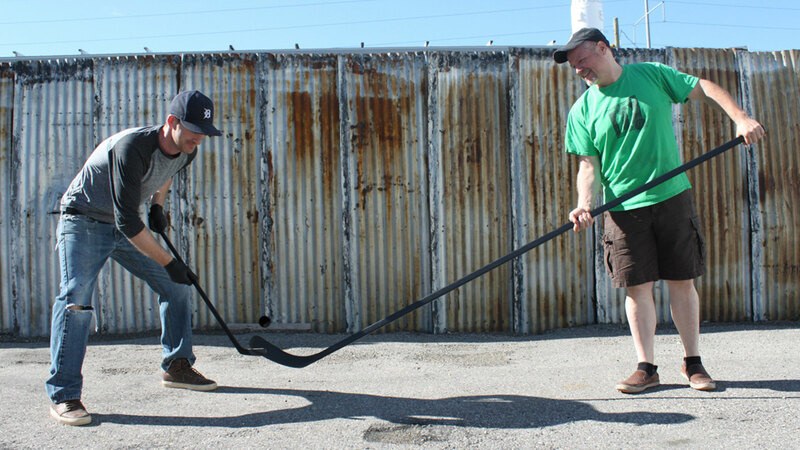 Al Henderson (right) tests out some hockey sticks for ‘Figures in Motion’ with Shane Hurl (left), from Carvel Creative. “I got a sense for motion — what the motion is like. And from that, I got a sense of the marks that are made on ice from skating on ice,” said Henderson. 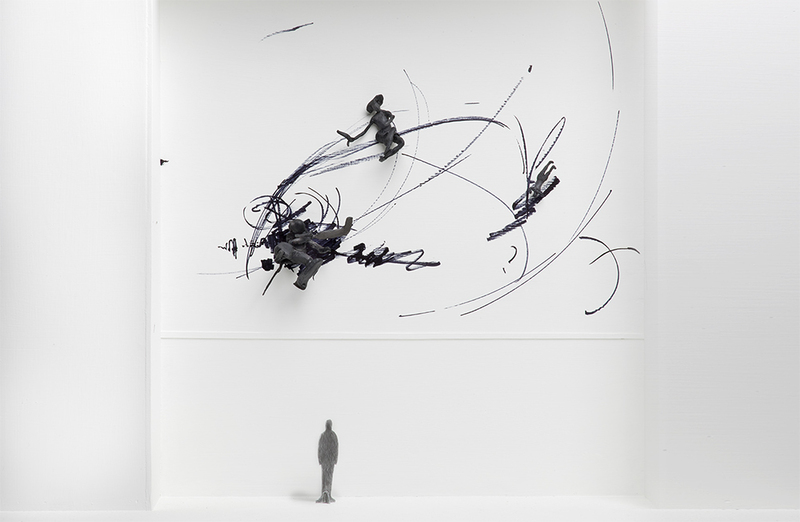 “It’s just a recorded memory of the motion that happened on the ice,” he said of the black abstract paint strokes that will compliment the three-dimensional figures. These figures include a goalie, hockey equipment and a figure skater. After being unsuccessful in obtaining another project in St. Albert, an acquaintance told Henderson he should apply for the public art call-out for Rogers Place. 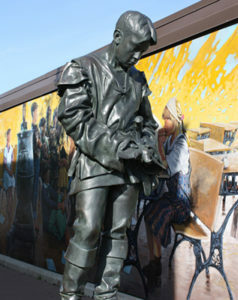 Similar to competitors on the ice, Henderson has experienced both achievements and disappointments in the arena of public art. “There’s a competitive aspect to it. There’s the ups and the downs of it,” he said. Being awarded the opportunity to create and display Figures in Motion inside Rogers Place and the Downtown Community Arena is an achievement that Henderson is evidently proud of. Henderson hopes that when the work is first viewed, patrons do not completely understand it. Having people engage with the art is the ultimate goal for any artist, he said, trusting that the more time taken to view the piece — and from different angles — the more the work will reveal itself to the viewer. The dark shapes offer contrast against the white walls, providing depth and acting as a focal point for patrons entering the Downtown Community Arena through Rogers Place. “As they approach it, it becomes clear what it is. And after that, some pleasure comes from the idea of the concept of it. That’s what I’m hoping for,” said Henderson. Although Henderson admits not all people connect with the same art — “Even the Mona Lisa is not for everyone,” he laughed — he describes art as something that occurs naturally in people. 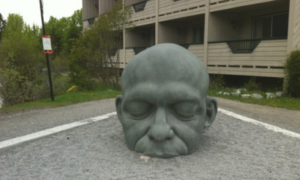 Besides Figures in Motion, Henderson has public art that can be found throughout Alberta including Ceannmore (Gaelic for “Great Head”) — a well-recognized sculpture found on Main Street in Canmore; Sam Livingston, Big Head found inside the Calgary International Airport; and St. Albert the Great located at Founder’s Court, Perron Street in St. Albert. 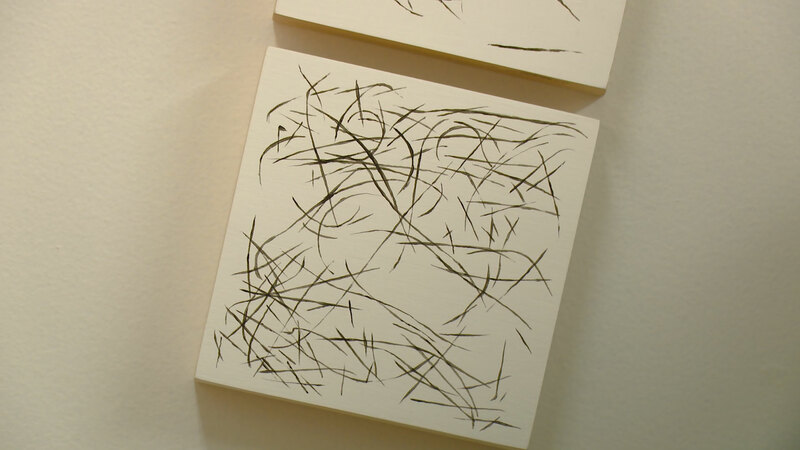 His work can also be found in Edmonton at the Douglas Udell Gallery. Installation for Figures in Motion is scheduled to begin in the coming weeks, in a collaborative effort with the Edmonton Arts Council, City of Edmonton and with the assistance of Carvel Creative for the final painting and installation of the work inside the new arena. Lighting designed specifically for the artwork is also being done by AltaPro to enhance the thought-provoking figures that represent the spirited, diverse and welcoming environment created by a community arena. “The community rink is our place,” Henderson smiled. Patrons visiting the Downtown Community Arena this fall will be able to view Figures in Motion firsthand when entering through Rogers Place. The Edmonton Arts Council will be hosting a bus tour on October 3, which will include a stop at Rogers Place and the Downtown Community Arena. Find out more about the public art installations at Rogers Place here.